Rodney Sturt Taylor was born on 11 January 1930, in Lidcombe, New South Wales, Australia. He was an actor, best known for appearing in numerous films such as “The Time Machine”, “The Birds”, and “Darker than Amber”. He’s also known for his final appearance in the 2009 film “Inglorious Basterds”. All of his efforts have helped put his net worth to where it was prior to his passing in 2015. How rich was Rod Taylor? As of late-2016, sources inform us of a net worth that is at $5 million, mostly earned through a successful career as an actor. Aside from films, he did stage and radio work, and also appeared in numerous television shows, with all of these achievements ensuring the position of his wealth. Rod attended Parramatta High School and after matriculating, went to East Sydney Technical and Fine Arts College. He mainly worked as a commercial artist before deciding that he wanted to pursue a career as an actor. He began appearing in various stage productions and radio shows, but he still needed to support his acting career with other jobs, so he worked at a department store, mainly as a designer and painter. In 1951, he had a part in the filmed documentary re-enactment of his great-great grand uncle explorer Charles Sturt’s exploration of the Murray River, and then in1954 he made his film debut in “King of the Coral Sea” which led to “Long John Silver”. In the same year he was then awarded the 1954 Rola Show Australian Radio Actor of the Year Award. Afterwards, he would land several television roles, and he also continued to appear in films such as “Giant” and “Hell on Frisco Bay”. His career on Hollywood was starting to flourish and it helped increase his net worth considerably. He was then given a contract at MGM after an impressive screen test for the film “Somebody Up There Likes Me”. He would appear in numerous supporting roles, and was then cast in “Separate Tables” which would gain several awards. In 1960, Taylor had his first lead role in “The Time Machine”, based on the book by HG Wells. This would lead to the series “Hong Kong”, and his net worth was starting to increase dramatically. He then worked on the animated feature “One Hundred and One Dalmatians” before starring in the thriller “The Birds”. Over the next few years, he made a lot of films that were mostly under MGM; some of the projects he became a part of include “The V.I.P.s”, “Young Cassidy”, and “The Liquidator”. In the late 1960s, he was asked to do more tough-guy roles, changing his image as seen in “Chuka” and “Dark of the Sun”. In the 1970s, he continued appearing in television shows and films. He starred in “Bearcats!” and also had a regular role in “Masquerade”. In 1988, he appeared in “Falcon Crest”, and would then guest star in “Murder, She Wrote” during the mid-1990s. During this time he would also return to Australia to work on several projects. Later in his life he moved into semi-retirement, but still had a few roles here and there. He made a cameo appearance in “Inglorious Basterds” in 2009, playing Winston Churchill. For his personal life, it is known that Rod was married three times, firstly to Peggy Williams from 1951 to 1954, then to model Mary Hilem (1963-69) – their daughter is CNN reporter Felicia Taylor. Rod’s final marriage was to Carol Kikumura in 1980, who was with him until, in January 2015, Taylor had a heart attack just a few days away from his 85th birthday, and passed away in Los Angeles, California. 1 He was once engaged to Anita Ekberg, who died four days after him. 2 He was considered to star with John Wayne in Rio Bravo (1959), Circus World (1964) and The War Wagon (1967), before he finally got to work with Wayne in The Train Robbers (1973). 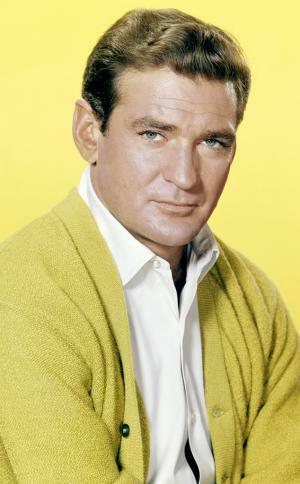 3 Rod Taylor fell down about two weeks before his death and was hospitalized. He returned home, and he subsequently had a heart attack and died in his bed at his home in Beverly Hills, CA, surrounded by his family and friends. 4 Is one of two actors to appear in movies, directed by Alfred Hitchcock and Quentin Tarantino. Bruce Dern is the other. 5 He was considered for the role of Colonel George Taylor in Planet of the Apes (1968) before Charlton Heston was cast. 6 Ran his own TV production company, Rodlor Inc..
7 Briefly pursued a career as a painter before turning to acting. 8 His father was a steel-construction contractor and draftsman, and his mother, a children's book author. 9 He originally planned to become an artist, and as a teenager he studied at the East Sydney Technical and Fine Arts College. He became interested in acting. He saw Laurence Olivier in "Richard III" on an Old Vic tour, and this inspired him to become an actor. 10 Was originally considered for the role of Roper in Enter the Dragon (1973) but was thought to be too tall, compared to the actor he'd be sharing many action scenes with, Bruce Lee -- the part eventually played by John Saxon. 11 Taylor had completely retired from acting when Quentin Tarantino offered him the role of British Prime Minister Winston Churchill in Inglourious Basterds (2009). At first Taylor declined the part, suggesting that Tarantino should cast Albert Finney (who had played Churchill to great acclaim in The Gathering Storm (2002)), but eventually the director talked him into it. 12 His second wife, Mary Beth Hilem, died on March 7, 2009. 13 Attended East Sydney Art College. 14 Played Tarzan in an Australian children's radio serial in the early 1950s. 15 20th Century-Fox considered him for the astronaut role in 1968's Planet of the Apes (1968) but, perhaps seeking a bigger box office name, gave the part to Charlton Heston. 16 Father of Felicia Taylor with his second wife, Mary. 1961 Golden Laurel Laurel Awards Top Male New Personality 5th place.